For sauce: In a small bowl, stir together chicken broth, vinegar, soy sauce, sugar, cornstarch, and garlic; set aside. In a large nonstick skillet, heat 3 teaspoons of the oil over medium-high heat. Add carrots and sweet pepper; cook for 3 minutes. Add pea pods. Cook and stir about 1 minute more or until vegetables are crisp-tender. Remove from skillet; set aside. Add the remaining 1 teaspoon oil to skillet. Add chicken to skillet. Cook and stir for 3 to 4 minutes or until chicken is no longer pink. Push chicken from center of skillet. Stir sauce; add to center of skillet. Cook and stir until thickened and bubbly. Add vegetable mixture and pineapple chunks to skillet; heat through. Serve with hot cooked brown rice. 67% less sat fat • 74% less sodium than the original recipe. 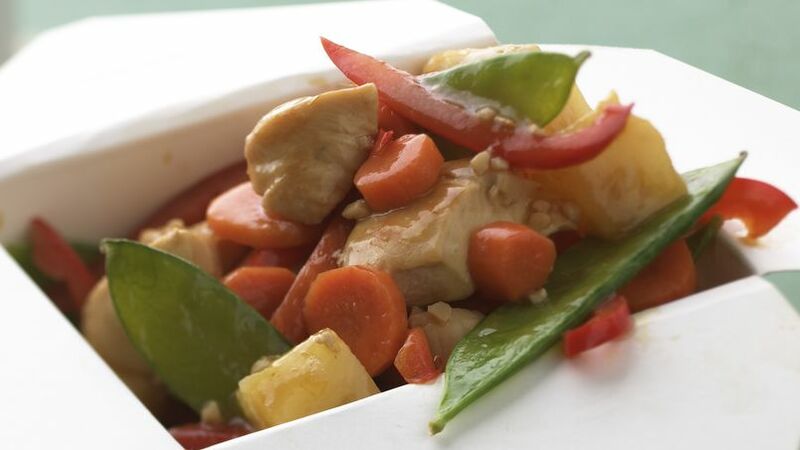 Power up with this super stir-fry. You’ll get more than 100 percent of a day’s vitamin A requirement plus 60 percent of your vitamin C.